Jesse Ezra Chappell was born September 23, 1876 at Hillesley in Gloucestershire County, U.K. According to the 1881 census, he was living at nearby Hawkesbury at the age of five. However, he was also listed in 1881 with Henry and Elizabeth Curtis at Latteridge. As a child, he attended Sunday school at the Hillesley Baptist Church and later the Latteridge Baptist Church. From the number of inscriptions in the Hillesley Baptist and St. Giles churchyards, it appears that Hillesley was "home base" to much of the Chappell family. Jesse reportedly emigrated to the United States in 1895 with the Curtis family. He became a U.S. citizen in 1902. He made subsequent trips between the USA and UK in 1906 and 1910. He was educated at LaGrange College near Hannibal, Missouri and also attended University of Chicago. He was a Baptist preacher and his first pastorate was the Calvary Baptist Church in Hannibal, where he preached his first sermon on July 2, 1899 and was ordained into the gospel ministry on September 12, 1899. An article about Jesse in the January 27, 1910 issue of The Word and Way provides some insight to Jesse's past. 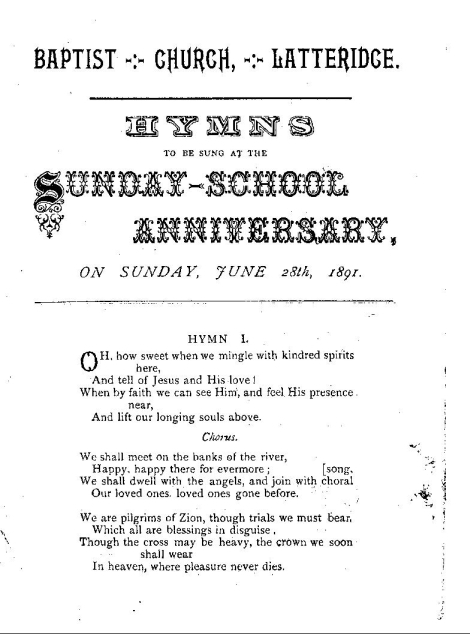 He wrote and copyrighted several hymns. Jesse may have been acquainted with Esther Holdway Chappell, who died in 1952 and Alfred Ernest Chappell who died in 1950. Jesse died in 1954. 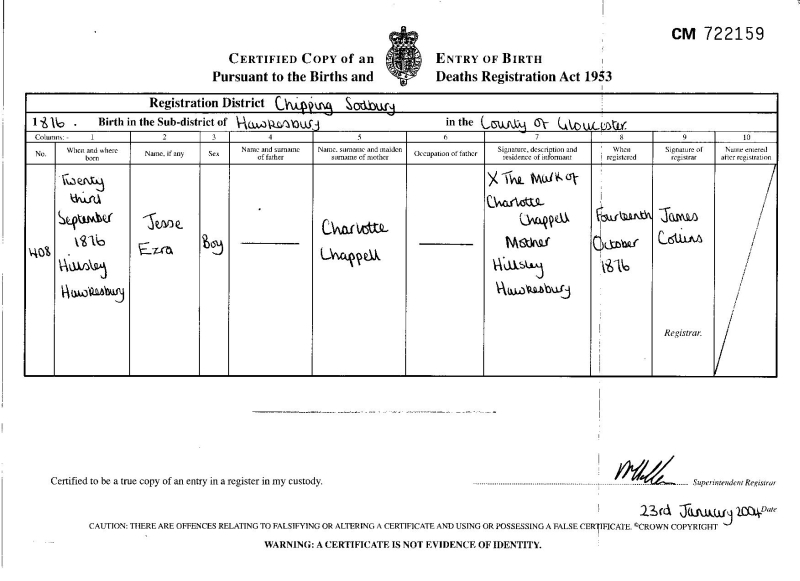 Jesse's mother, Charlotte Chappell, who later married George Clark, died in 1933 at the age of 93, and was buried at St. Peter's Church in Frampton Cotterell. In a 1906 letter she thanked the Calvary Baptist Church for allowing Jesse to visit her for Christmas. Charlotte's parents were Aaron Chappell (1797 - ?) and Mary Mizen (1810 - ?). Aaron's parents were William Chappell (1755 - 1843) and Hester (Lewis ?) (1759 - 1832). William's parents were Robert Chappell (1720 - ?) and Elizabeth Brown (1740 - ?). They all lived at Hawkesbury but had connections with Hillesley, some being buried there. Jesse had two older brothers, Henry Chappell, born in 1865 and Charles Frederick (Charlie) Chappell, born in 1870, and an older sister, Sarah, born in 1861. Charlie's children included Rosie, Bessie, Em, Harry, Fred and Jesse. Jesse had several cousins, including "Louie" Cook, who he spent time with as a child. He saved letters he received from "Louie" in 1900 and 1930, which can be seen here. Jesse married Pansy Elreda Ardrey on November 2, 1914. His mother sent this 1914 letter to Jesse and Pansy. Pansy was a teacher at Hannibal, Missouri as well as organist at the Calvary Baptist Church where Jesse was pastor. Jesse and Pansy lived in various places including Iola, Kansas and Sheridan, Wyoming before finally settling in Louisiana, Missouri. They begat Charlotte Margaret Chappell at Hannibal on May 4, 1916 and David Paul Chappell at Macon, Missouri on August 10, 1925. Charlotte married James Biggs and they divorced without children. She died May 27, 1993. Pansy's parents, William Greening Ardrey and Isa Margaret Virginia Liter, married in 1885. Isa was William's second wife. His first wife, Charity C. Turley, was born July 25, 1849 and died April 23, 1884, after bearing six children with William. William died December 19, 1909. Pansy was born January 30, 1892 and died January 18, 1975. Pansy's brother, Joseph Clifton Ardrey was born April 20, 1897 and died June 23, 1966. David and Jo Chappell were married March 22, 1947. They lived in Norman, Oklahoma awhile but settled in Hazelwood, Missouri where they begat John Clifford (March 2, 1951), Roy Jeffrey (December 31, 1952), Miles Gregory (October 11, 1960), and Jessica Ellen (March 25, 1964). They later moved to Santa Clara, California. Jo was born August 2, 1923 and died September 8, 1988. One of her favorite places was China Grade. Jo's parents were William (09/16/1889 - 05/22/1956) and Pearl (02/10/1897 - 09/30/1940). They were married 04/13/1920. Jo's sister, Jean, was born 10/10/1925, and her brother, Jake, was born 07/18/1931. Jean married Joe Setnor on 06/19/1948 and they begat William John "Buzz" Setnor on 05/15/1950 and Michael Paul "Chip" Setnor on 08/04/1952. Jake married Rosalee on 01/10/1953 and their daughter is Andrea. John married Rebecca (born March 22, 1950) on August 7, 1971. They lived in Iola, Kansas awhile, begat Stephen David and Kimberly Anne there, and later settled in Lawrence, Kansas.